The most important economic entity in the world, the one that every economist tries to decipher, the entity that is supposed to pull the world economy out of its funk with debt-fueled, beyond-their-means, damn-the-torpedoes splurges, has done a lousy job. The American consumer has been lackadaisical despite, as the EIA gushed, the lowest gas prices “heading into a Thanksgiving holiday weekend since 2008.” Instead of spending that windfall on something else, they have the temerity to save some of it. So the savings rate, according to the Commerce Department on Wednesday, rose to 5.6% in October, the highest – and for our shocked and appalled economists the worst – level in nearly three years. 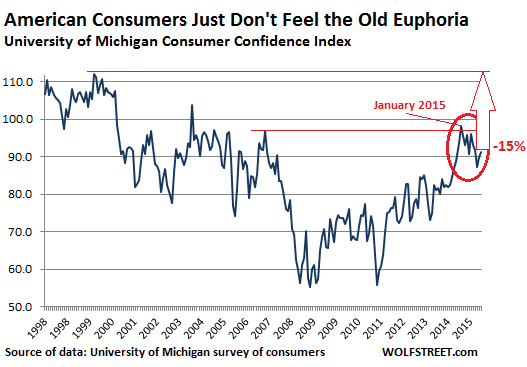 “I think this is tied to a decline in economic aspirations,” University of Michigan consumer survey director Richard Curtin told Bloomberg to explain the rising savings rate and the so-so results of the consumer sentiment index that had just been released. November’s final reading of the sentiment index edged up to 91.3 from 90 in October. While consumers at the lower end of the scale began hoping for wage increases, and thus became more optimistic, those at the top end of the spectrum, accounting for more than half of consumer spending, grew more worried about their financial prospects. They don’t expect to be in a situation where they once thought it was their right that their living standards would always increase, their children would be much better off than they, and their grandchildren and so forth. And they bought things on credit with the intention of working more to pay off the increased debt, and we saw a rise in labor force participation and a rise in women entering the labor force and so forth…. I’m not trying to say that the data predict this sort of secular stagnation, but it is now more consistent with the slow-growth economy. And I’ll just give you this thought experiment: If we only grow at the 2 to 3 percent range over the next decade – well we’ve only had 2 percent growth over the past five years average – people cannot maintain the same material aspirations that they had prior to that. People would not maintain aspirations that were always frustrated, that they could never accomplish. People lower their aspirations given the situation. And we’ve known this all over the world, that people can adapt to the worst conditions as easily as the best conditions. So this shopping season is going to be a slog for retailers: 45% of the respondents said that the purchase of durable goods, such as TVs and appliances, would be contingent on discounts, one of the highest rates in the survey’s 50 years, Curtin said. So retailers, in addition to other challenges, will face some serious margin compression. But wait…. The highest savings rate in nearly three years, whether it makes sense or not, coincides with a borrowing binge. Consumers are “re-leveraging” as if they’d long forgotten the Financial Crisis and what it had done to overleveraged consumers. 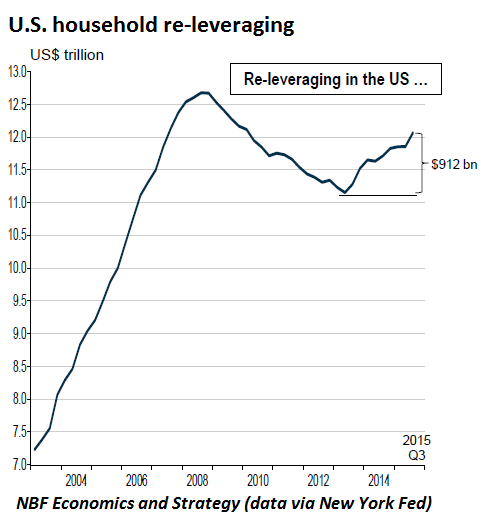 Aggregate household indebtedness in Q3 jumped by $212 billion to $12.07 trillion, the New York Fed reported last week, and is now only 5% shy of its peak in 2008 of $12.68 trillion, a catastrophic level of indebtedness, it turned out, when layoffs started mucking up the scene. 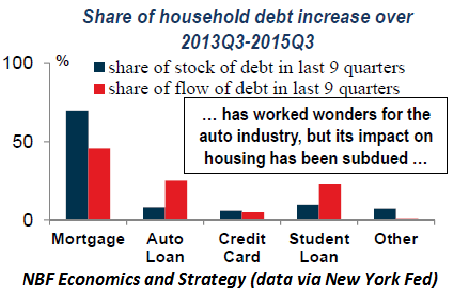 In the last nine quarters, auto loans represented 25% of the flow of debt despite accounting for just 8% of the total stock of debt. That explains why auto sales have been so strong in the last couple of years ─ this year’s sales are on track to average roughly 17.5 million units, the highest ever. Thus, the one major manufacturing sector that has been booming, and a retail sector that has been doing well, is based on super-cheap consumer debt with a dreadfully large component of subprime. As all debt binges, this one too will run out of juice. This is the state of the American consumer. Folks are borrowing like mad to fire up the auto industry and pay for education. Healthcare expenses are eating their lunch. Housing costs are bleeding them dry. So they’re pinching pennies and demanding discounts wherever else they can. And some of them, the upper portion of the spectrum, those that account for nearly half of all consumer spending and are now worried about their financial prospects, well, they have the appalling temerity to save a little more to be better prepared for future uncertainties. So it might be a, let’s say, complicated shopping season. ← Spain Braces for its Biggest Corporate Insolvency… Ever! Well Bob, it seems some people these days are doing something that won’t land them in jail and is really making a difference: they are saving money. I say it’s a good start and, given how miserable the interests paid on savings these days (unless you want to gamble in the great casinoes in New York, London, Shanghai, Tokyo etc), a damn brave thing to do. Of course it won’t last: sooner than later we’ll be forced to bail out all the people who needlessly sank into debt and the big companies that depend upon them to service enormous debts and pay inflated dividends. Again. And this if inflation doesn’t impact our ability to save: perhaps the US are immune, but despite all the ECB propagandists screaming “deflation!” here in old Europe things are really heating up. My utility company sent me a letter to inform me my natural gas bills are about to go up (despite NG being down 20% year on year) and food prices are flaring up. Just to give an example bananas went up exactly 50% from January. Even citrus (heavily subsidized through CAP) prices are shooting into the stratosphere and I try to avoid buying beef whenever possible because it’s insanely expensive. Perhaps the ECB is worried that Samsung dropped the price of their latest and greatest smartphone from €1000 (€1200 if you pay it through your plan) to €850… let them eat smartphones. The point is I would have absolutely no problem with people sinking into debt to buy new cars they don’t really need (an old Toyota Corolla or Honda Civic can get you to work like the latest toy car and will be far cheaper to run and much more reliable) or companies leveraging to the hilt to pay overgenerous dividends if I weren’t forced to subsidize them and relieve them of their accountability through neverending bailouts masked as “stimulus” and “quantitative easing”. My choice of saving and being a cheapskate doesn’t hurt anybody: not spending money is not a crime, although many would like it to be. The vast majority of people that you’re painting with just about the broadest brush stroke possible in history, are not on the receiving ends of all those government bailouts. Lest you forget, it was the big banks and high finance that reaped the whirlwind benefit of all the bailouts. The percentage of people who actually get a mortgage modification is so pedantically small as to not even be contextually useful in the grand scheme of things. You keep on going right ahead and believing that it’s all the little people who caused these problems and benefited from the bailouts while the GOP, the banks, Wall Street, and the rest of corporate America keep pulling the wool over your eyes. You’re their favorite kind of customer. Bob, you could start by not sending the same bunch of bandits to DC over and over again. A third party vote or write in is a dissent they will all understand. It isn’t about winning because both parties are the same, they represent their donors. It is about standing on line and letting them know you are pissed off. A vote for “None of the Above!” is more responsible that voting for the lesser of the two evils.. Voting for the lesser of the two evils is still voting for evil.. People have been doing that to long and this is what we get..
“George Washington” won the revolution in no small part because the French Navy was parked offshore. His army was in all likelihood largely rather desperate individuals with no better options. I’d recommend reading some history above the level of a 5th grade text book: spending your energy grumbling that people are less heroic than some fictional version history is not particularly helpful. Regarding military service, are you aware of what the US military has been doing in the middle east for the past 14 years? And you would advise young people to go participate in that? Honest question. This will all end in tears. How can it not? Wow! You must live in a wonderful country if you do not have utility bills and so forth on top of your federal, state and county taxes. 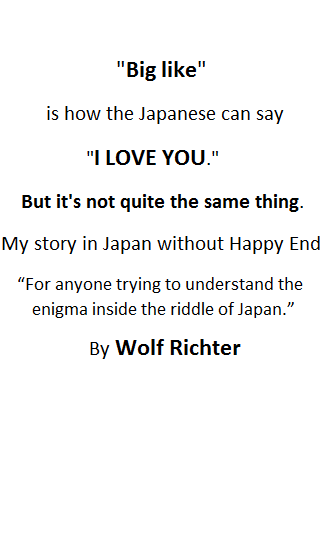 You win… it’s not fair to Wolf to keep this going. And what bizarro world do you live in where all those little people actually ever get bailed out by the federal government instead of the big banks and corporations? Really, please provide me with the prior precedent of this ever happening. The closest I can think of is the WPA, and that was far from what would be considered a bailout. They worked and worked hard for those meager earnings. Below, find posted some appropriate lyrics for Black Friday and the fretting over people saving as opposed to consuming. I have been scratching my head over this debt issue. Wouldn’t you think, that a country for the people and by the people would be pleased citizens were financially stable, able to pay their way, would have sound values and stable homes? I ask this about all democratic countries, not just the US. Really, maybe consumer debt is great for business owners, but eventually it is going to be hell for everyone if all the threatened defaults take place. My kids, when they were little always used to ask why I drove a beater instead of something flashy? They always wondered why I was content with my rancher house? (Mind you, it had oak floors, a pool in the 1/2 acre backyard, and a view….but it was the smallest house on the street). But they did notice we never had debt, no student loans to pay, in fact no debt beyond mortgage and tax time, which money was set aside for monthly. Plus, we camped and fished instead of traveled, walked and biked instead of skied, and golf didn’t interest me. As they became adults and bought their own homes and worked full-time they understood that Dad retiring out of choice was possible because he had never had debt. There was no idea of Black Friday back then, but there were auto loans and people in trouble with credit cards. If people let tv and social norms raise and guide their children in a consumer led society, this is what we get. (I just watched a Black Friday fist fight video. In some countries people fight over the relief trucks handing out bags of rice or water bottles. In the US, some people (SOME people) fight over plastic crap and electronics (which they probably cannot afford, anyway). Sometimes those combattants are jiggling obese. It is all quite sickening. I cannot imagine where all this is heading? Not to worry. The gov’t and banks have a solution to this crazy notion of savings. Negative interest rates, bail ins, banning cash, all on deck. You are 110% correct. Soon to come negative interest rates in banks near you, just in time when people started saving money. The banks solution is more likely terrorism and war to distract you with fear. The insanity is so gross, it is evil. We have got to get back to the garden. Crosby, Stills and Nash all the way back to Woodstock.. and things appear to have just gotten worse and not better. What ever happened to the “Flower Children”? Many of those hippies grew up to become the first wave of Yuppies. They traded in their paisley shirts and Birkenstocks for corporate drag, and Woodstock for Wall St. They became The Man. And they taught their children to do the same. her rarest hue to hold. Both songs are great to hear and feel. Though Joni Mitchell recorded Back to the Garden before CSNY and I think she wrote it. CSNY took a chance recording Teach Your Children since they were viewed as a rock band and the song is country. A song that always moves me is CSNY’s Suite: Judy Blue Eyes- a song about Steven Stills’ break up with Judy Collins. So the consumer is re-leveraging and at the same time increasing the savings rate. I guess that means I guy goes to work, earns $100 then spends $95 / saves $5 AND borrows $50 to buy something else. Have I got that right? Seems to my simple mind that in this case the guy has spent $145 on his earnings of $100. Ain’t no savings in that cornmash. Or one guy with higher income saves $5 and ANOTHER guy with less income borrows $50. That’s what the reports seem to suggest, when you look at them together. The Ponzi Economy is not going to be fixed, ever. That would require actually repaying or defaulting the trillions of dollars of excessive debt that weighs down the world economy like an albatross. Taking on additional debt always means new principal and interest payments. When rising principal and interest payments consume too much of current income, people are forced to stop borrowing. In today’s environment, young people are postponing or foregoing household formation and having children because good-paying jobs are non-existent and the cost of living is prohibitive. As such, the powers that be will continue to to use their assortment of baling wire and duct tape fixes to try to patch up the economy every time there is a financial crisis. This dog and pony show will continue until there is one final crisis of confidence. When people no longer believe the phony fixes and outright lies, the entire system will collapse. Perhaps a few people with honesty and integrity will survive and be able to build a new system. Until then, all a person can really do is brace for impact. yes, Vegasbob, I agree. We’re all in a train car, shackled to the seats, looking in horror as the engine careens off the tressle, sailing to the rocky bottom……..it’s gonna hurt !!! …… Runaway train, never going back. Wrong way train on a one way track. Saving money, whether for an “emergency fund” or, for later investment is ALWAYS in fashion. Our government should try it someday -especially the defense area where a 50% cut is probably too little. On the idea of “jail time” for not paying taxes. Who are you kidding? No space, no money, and if you get caught, there is always the bargain to settle for less than their demand. To date, I have always used a licensed CPA to do my taxes. However, getting older, bolder, and senile, I doubt they would ‘find me’ should I decide my 1960’s revolutionary spirit is now in control. Yes, got a notice from my natural gas utility supplier my rate for 2016 will be declining about 3.4%. Nice to see that my decision to pre-buy natural gas has been a “winning decision.” Not every state’s utility regulator allows the ultimate consumer this discretion, but our does. It pays to have a citizens utility board in place to fight for the consumer! There is a question that needs to be asked of those who think that managing a budget for millions of people is qualitatively different from managing a budget for six people. The people who fully subscribe to the magic of the multiplier effect- John spends 10 dollars on a hair cut, the barber spends it on lunch, the restaurant owner spends it on food, etc. etc. All that is missing is the starting injection, which should come from government, which in turn recovers the ‘stimulus’ from taxing the aforementioned. The question is this: is a counterfeiter, normally subject to harsh penalty, not really a benefactor? Of course he must be competent. His notes must not be detectable as not issued by government. But if they pass this test, why should they not serve just as well as the ‘genuine’ article. Of course, the question is really an example of the ancient argument known in English as ‘reduction to an absurdity’, since I think it is absurd to describe a counterfeiter as a social benefactor. But for one, apparently sane, or at least able to type and spell, gent in the UK it failed. He thinks it doesn’t matter who prints the stimulus. It’s all good even if it’s bad. A large group that evoked change and spearheaded growth. A large group that represses growth and fights to keep their established entitlements at the expense of everyone behind them. Real change occurs when a large group evoke it. JFK and here in Canada, PET, were fortunate to be there at the right time when the mass shared their vision. Obama could have been a great leader, but Generation Greed ruled the day. Here in Canada I fear that the recently elected Trudeau.2 will face the same fate. I am fortunate to have a decent job, but at a time when I should be calculating my time until retirement, I can only question if I will be able to retire; in saying as much, how many of us are in the same boat, therefore stifling the opportunities of the young? When PET took office Canada had no debt. When he left after his minority government had been extorted by the NDP, the dollar was at 62 cents and serious people were suggesting it might be necessary to approach the IMF. Has anyone given any thought to the idea that, as a form of affirmative action, lawyers should be barred from the higher offices in politics? It’s just a thought of course, but no group is so over represented, and no professional group is further from actual economic production. I can appreciate your opinion, though my main point was to indicate that change has to be pushed to the forefrunt by the masses. Amen, brother, amen. The Boomers are the problem. Set themselves up real nice and then pulled up the ladder behind them and haven’t let it back down yet. I’ll be doing the happy dance when the last of the boomers dies off! Never has a generation thought so highly of themselves whilst effecting no real change, except to fatten their own wallets and bank accounts and screw every generation that’s come after them since!